If you carry credit card balances, student loans, a mortgage, car loan or other debt, you’re not alone. In fact, the average household has $137,063 in debt!1 For households carrying credit card debt, the average balance is $15,983, costing them $1,300 per year in interest.1 Becoming debt free is an exciting milestone that many of us are working towards. After all, paying off your debt means you now have extra money each month that you can put to work elsewhere, like building savings and investments that can help you build a brighter future. Still, just because you’re working towards paying down your debt doesn’t mean that is, or should be, your only financial goal. Financial experts say building an emergency fund savings of at least three to six months of living expenses is important too!2 With that, it can be difficult to determine what is the best way to prioritize how to use your income – do I pay down my debt or do I save? In general, if the interest you’re paying on your debts is higher than the interest you earn on investing, you may be losing money. At the same time, not having any savings could also be risky. Unexpected expenses like car repairs, a leaky roof, or other surprises – they happen! Not having the savings tucked away for emergencies can create a long-lasting burden if you have toturn to a high-interest credit card, digging you deeper into the debt cycle. So, what do you do? The answer is, you should probably try to do both – pay off your debts and save. That might sound impossible, but with a smart strategy in place that focuses on lowering your interest rates and unnecessary spending, you can start increasing the amount of money that you can put towards saving. Knowing where to start is a challenge for many of us, so we’ve broken it down for you. 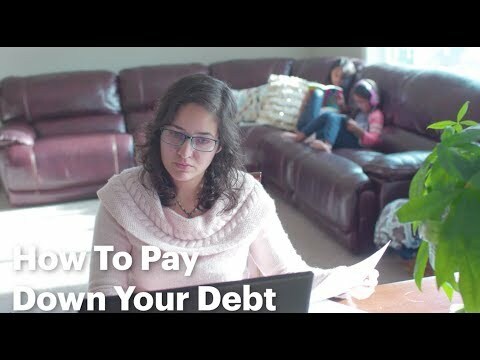 Understanding the different types of debt you have and how much interest is costing you over time is foundational knowledge to start setting a plan. Start by organizing all of your debts – credit card balances, mortgage, car loans, personal loans, etc. – into a list that includes the amount owed, interest rate, and minimum payment. Determine which debts you should eliminate first, and which ones you can prioritize next. Debt from things like student loans, home mortgages, personal loans, or business loans generally have lower interest rates with a fixed pay-off date, so paying them off is easier to budget for and you don’t get lost in a revolving debt cycle. Evaluate your debts and make a list based on interest rates and pay-off period. The next steps will help you build a plan on how to tackle paying off these debts. Now that you have all of your debts written down, take a look at your high-interest debt and see if there’s a way you can reduce your rates. For example, if you have a mortgage with 3.5% interest rate, you generally should keep on course and pay the monthly amount because that is a pretty good rate. However, if you have high-interest credit cards and are only paying the minimum each month, the interest is adding up and can cost you thousands over the years. Investigating ways to lower your rates can save you big dollars that you can put towards paying down debt or saving. One path you can take is to pay off your high-interest debt with a personal loan. If you maintain a strong credit score or find that your credit score has increased recently now is a good time to see if you can qualify for a lower rate. Consolidating your debt with a fixed low-interest personal loan may not only save you money, but also give you the relief of streamlining your finances and knowing a clear pay off date that you can circle on your calendar. Another option worth considering is a credit card balance transfer. If you have some room available on another credit card, check and see if you can get a balance transfer offer to move the high-interest debt to a card with a lower rate of interest. Some credit card issuers allow you to open a new card and transfer over your existing balance from your other cards, but most balance transfers come with 3% fee. Some credit card companies will have a promotional period for well qualified borrowers – usually lasting one year or less from account opening – where they will offer a low interest rate on the entire transferred balance, sometimes even 0% during the promotional period. If you can afford to pay off your full balance during the promotional period, you should! This move could save a significant amount in interest and get you closer to being debt-free and put that money towards saving. If your credit health has improved over time or if you’re earning more income, there could be opportunities in which you can qualify for a lower rate on installment debt through refinancing. You can easily get your free credit score and free credit monitoring by signing up for Upgrade’s Credit Health. Consolidating your debt with a personal loan, balance transfer to a credit card, or refinancing a loan won’t make you debt free immediately, but it could help you get lower rates and could help you save money that you can use towards paying down your debts or save, so it’s a great place to start. If you can determine your eligibility for a refinancing without a hard inquiry being placed on your credit profile, it doesn’t hurt to find out how much you can save. Evaluate your monthly income and expenses and determine how much you can contribute toward paying off debt or put into savings. Could you cut back on eating out or buying that $5 coffee every morning? Cut your gym membership? Ask your cable company for a reduced plan? Start a side hustle? Finding ways to cut back on spending and create extra cash can allow you to apply that money towards taking down your debt load or put it towards your savings.Once you have a grasp on your cash flow and determine where you can generate more money, the next step is putting that additional cash towards a smart payment and saving strategy. Record all the after-tax income you earn each month. Start with your salary and/or hourly wages but don’t forget other income from things like investments, Social Security checks and side hustles. Start with the fixed expenses, like your rent and gym membership, then factor in discretionary spending, like dining out and buying clothes. You should also include contributions to your savings account and debt payments as expense categories. For expenses that fluctuate – like groceries or utility bills – take a monthly average by looking at the past six months, add it all up, then divide by six. Each person’s financial situation is different, so setting up your payment strategy should be tailored to you. These steps won’t make your debt disappear instantly, but they can help you emerge out of debt faster. Take down your high interest debt or “bad” debt first. From a savings perspective, chipping away at your high-interest debt first is best. If you see that you can afford to put $250 towards paying down your debt, start with the one that has the highest rate first. Pay the monthly minimum on government student loans, car loans, mortgages and other low-interest installment loans. These types of loans typically have lower interest rates, and mortgages and student loans sometimes offer tax benefits. Continue to stay on course and make regular fixed payments based on the terms. What will help my credit score? If you’re planning to buy a home or a car, or take out a loan for other reasons in the near future, it may be worth paying down your credit cards. That’s because lowering your credit utilization ratio can have a positive impact on your credit score and in turn, you can qualify for lower interest rates in the future. If you’re planning to buy a home or a car, or take out a loan for other reasons in the near future, it may be worth paying down your credit cards. That’s because lowering your credit utilization ratio can have a positive impact on your credit score and in turn, you can qualify for lower interest rates in the future. Each month, use your income to pay expenses that you’ve put into your budget first, then dedicate whatever is left to savings or reducing your debt. If your goal is to save three months’ worth of expenses, calculate how much you need to save and how much money you can put towards that goal each month. If you were able to find ways to lower your rates or remove unnecessary expenses you can apply that money towards your savings and investing plan. Here are some tips to get you started. Set it and forget it. Open a savings account and set it up so the fixed amount that you determined you can save are pulled automatically into your savings account each month. You could also check with your HR person to see if your employer can automatically take a portion of your paycheck and distribute it into this separate savings account. Accelerate faster towards your savings goals. Dedicate any extra money that you receive (raises, bonuses, money gifts) to your savings accounts. Everyone’s financial situation is different, and taking the steps to analyze yours and to strike a balance between saving and paying off debt will help you get on track to a better financial future in the long run. Paying off your debt will not only bring some relief, but freedom to use that money towards other opportunities. Getting started on a savings plan may seem counterintuitive when you’re also trying to tackle your debts, but building these extra funds will help you avoid falling deeper into high-interest debt when life’s surprises happen. Your debts won’t be eliminated overnight and your savings will take time to build, but with a little self-discipline and goal-setting you will be on track to a better financial future. To learn more about credit and get other tips to help you achieve your financial goals, check our Upgrade’s Credit Health Insights.